You realized the Gucci Cruise 2019 collection was going to be different when driving through the gates of the infamous Alyscamps at 9 pm in Arles, France. This ancient Roman cemetery, which was founded in 4th century AD, has turned into the playground for Alessandro Michele tonight. The show started with the flames on the ground lit up one by one, dividing the stage into two. Along with the church bell ringing and the soundtracks of choir playing in the background, the Gucci Cruise 2019 theme is pretty obvious— funeral and death. With 114 looks in total, Alessandro wrote in the show note that it is filled with different characters such as "widows attending grave sites, kids playing rock ‘n’ roll stars, and ladies who aren’t ladies." I cannot deny that Michele's designs might look very similar at the first glance, but pay more attention to each look and the details. You will be amazed by how many histories and cultural knowledge required to fully understand the collection. "Alyscamps is a Roman cemetery, but it's also not a cemetery, it was a promenade, it became a walk in the 1700s; it is hybridized, it does not look like a cemetery because it is and it isn't. I like things that seem like something but are not," #AlessandroMichele. Flames and fire divide the runway which features candles burning on iron candelabras for the #GucciCruise19 fashion show on the Promenade Des Alyscamps in Arles. The ancient site, where Roman citizens were buried, is the setting for the new collection showing live now on Gucci's Instagram Stories. The Italian designer brought up the theme when the first model walked down the catwalk in the pink jacket and lace stockings with the cross necklace. Then followed by curly hairstyle inspired by Queen Elizabeth I and cross accessories, the model in the all-black gown was holding the bouquet, symbolizing widows visiting their beloved husbands in the graveyards. Look closer at bejeweled hollow rib embroidered on the full-black gown, while the other one was the mid-century missionary with a velvet cape and cross choker. Michele presented a pair of pants that said "memento mori", which is Latin for "remember the death". The green laced gown was one of my favorite looks of the collection. The model was also styled in the wig, and her hands in lime green gloves were holding a cross necklace. I simply love the outstanding color chose and how serene the whole outfit is. However, we all know Michele was not going to finish his collection without some shocking, even Instagram-worthy moments. The death mask truly astonished everyone. It was usually made in wax or plaster cast in the old times yet the designer "Gucci-fied" the mask into pantyhose material with two blue diamonds in front of the eyes. Also noted one of the looks was included a black veil that actually looks like the Papal tiara, which is worn by the Pope. With the white wisteria bouquet, the entire outfit is modern, ornate and delicate. The finale look is the "ghost bride" in ruffled voluminous white gown and a feathered hat inspired by a vintage design of Frank Olive. You have to be well-prepared to watch the show— to be surprised by the brilliant details in each look and ready to embrace all kinds of historical knowledge Alessandro conveys. The death theme was unquestionably the highlight of the Resort/Cruise season. 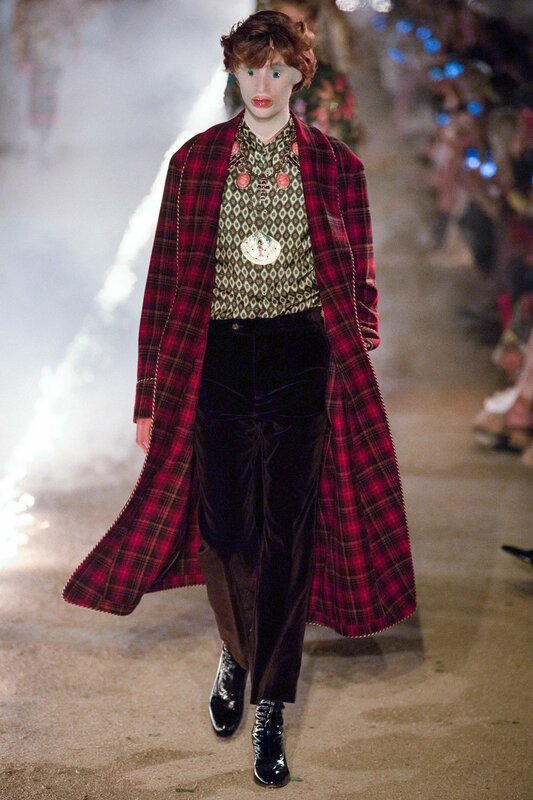 The 46 years-old creative director again successfully brought out the other magical side of Gucci. Alycamps is just another place tonight where Gucci tells its own fairy tale that will be remembered for decades.